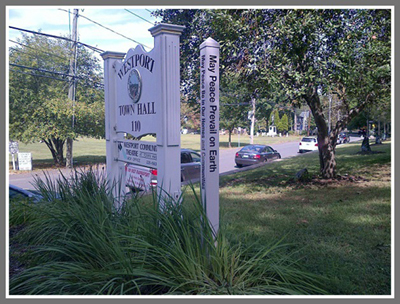 WESTPORT – Officials in Westport are all for peace, but they’re stumped by who left a “Peace Pole” firmly planted in the dirt next to a sign for the Town Hall on Myrtle Avenue. It didn’t show up overnight, but it has gone relatively unnoticed. “Nobody has any recollection, which is very unusual,” says Westport Selectman Helen Garten, who would like to find out who placed the Peace Pole at its current location. 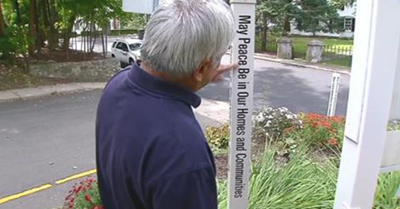 The white Peace Pole with black letters reads, “May Peace Prevail on Earth” and “May Peace Be in Our Homes and Communities.” It is a simple message that is spreading globally, with peace poles popping up all over the place.